4 Bdrm Detached Dwellhouse. Ground flr: V/bule. Hall. Cloakrm with wc. Lounge/Dining area. Kitch. Shower rm. 3 Bdrms. 1st flr: Bdrm. Dressing rm (CT band - G). Garden. Garage. Parking. 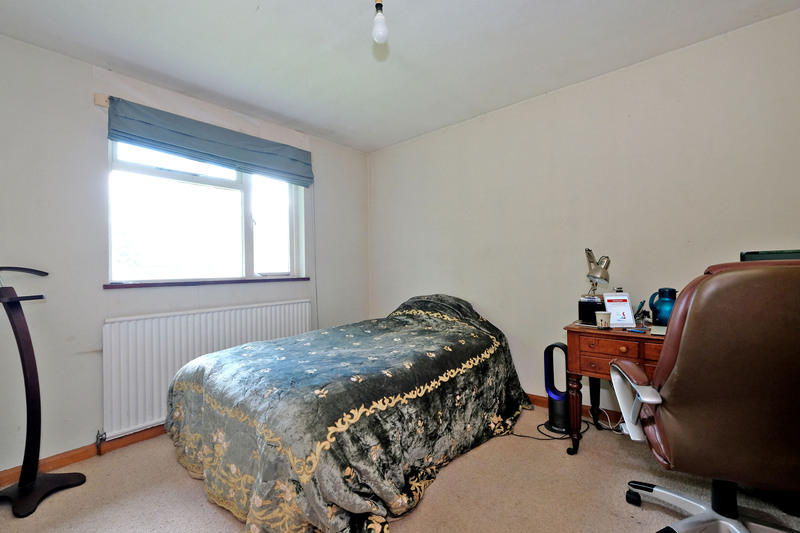 Price over £199,000 Entry by arr. Viewing contact solicitors. (EPC band - F). 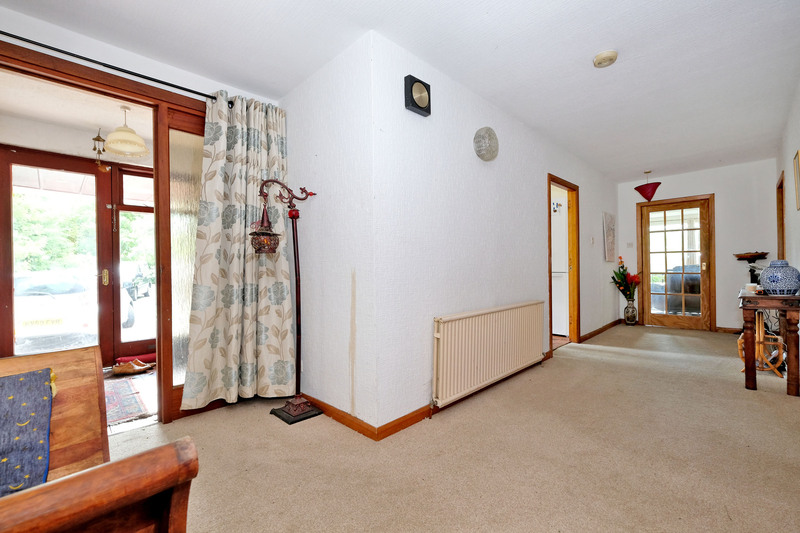 4 Bedroomed Detached Dwellinghouse. Spacious Accomodation. Oil Central Heating. Double Glazing. Large Garden & Driveway. Single Garage. This is a spacious detached Dwellinghouse situated in the quiet village of Muir of Fowlis which is surrounded by beautiful countryside and is around 4 1/2 miles from Alford. 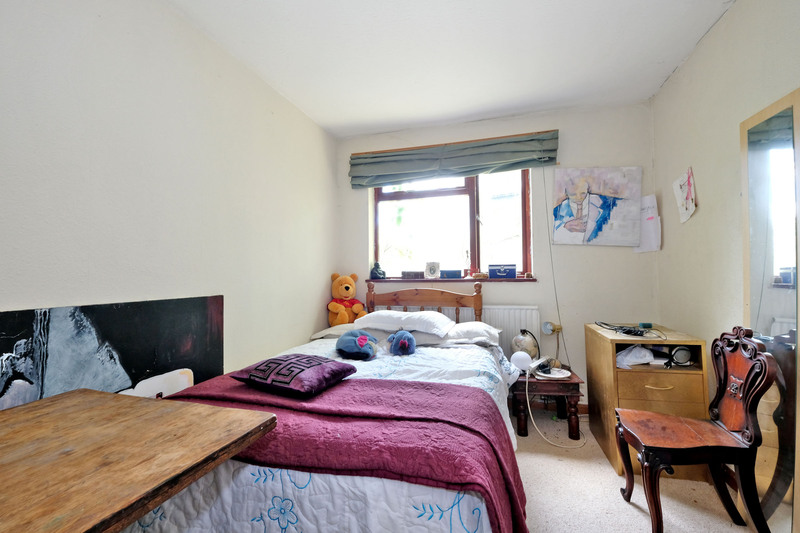 The property has a spacious interior over two floors, with the upper floor being able to allow a family member a degree of privacy as it has the ability to be self-contained separating it from the rest of the accommodation. 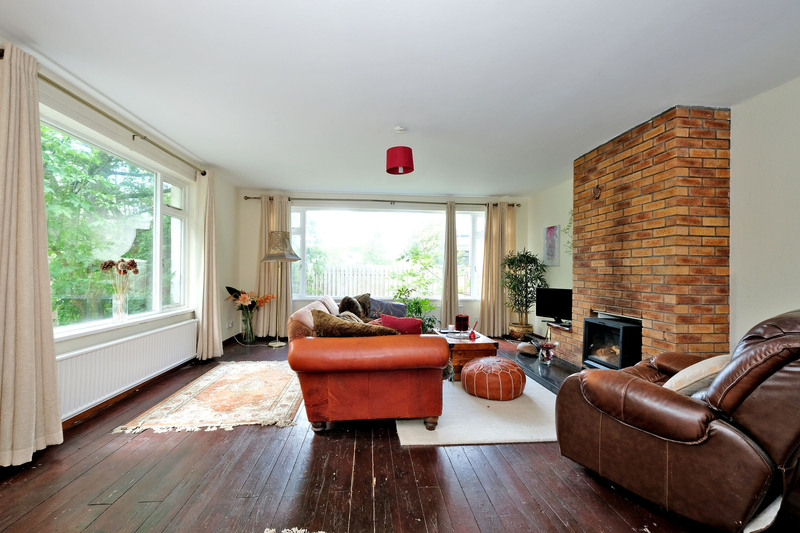 There is a large front driveway, single garage, private rear garden with a small stream providing a tranquil setting. Location: Muir of Fowlis is around 4 1/2 miles from Alford which provides a variety of shops and amenities. In addition to the golf course there is a bowling green, refurbished tennis courts, swimming pool and dry ski slope. Alford is also the home to the Grampian Transport Museum. 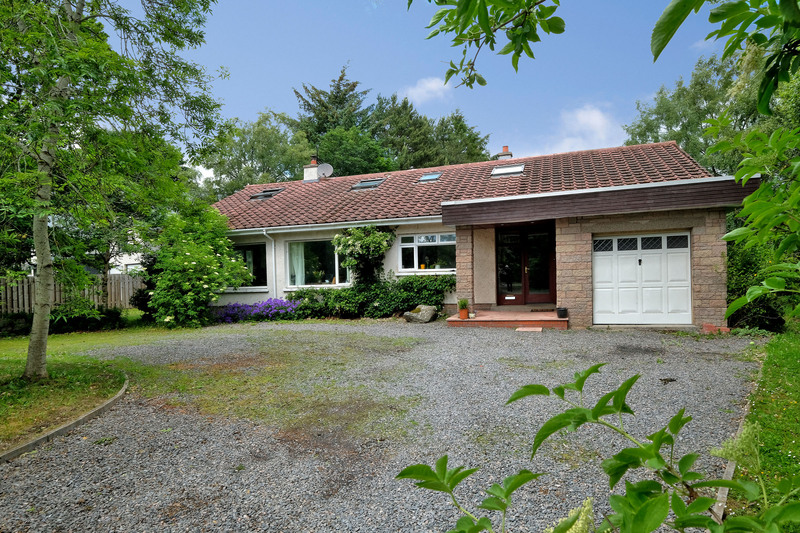 The property is within easy commuting distance of both Aberdeen and Inverurie. Directions: Heading on the A944 towards Alford, turn left at the sign for Muggarthaugh Hotel, road signposted Tough and Muir of Fowlis. Follow this road along to the cross-roads and turn right into Muir of Fowlis, Elmarinda is situated a short distance along here on the right hand side clearly indicated by a Peterkins For Sale Sign. Entrance: Entered through glazed door with glazed side light. The Entrance Vestibule is of a good size with ceiling light fitment and wooden floor. Low level cupboard gives access to the fuse box and meters. Opaque glazed door and side light leads to the Inner Hallway. Hallway: A bright and spacious Hallway with ceiling light fitments and smoke detectors. Telephone point. 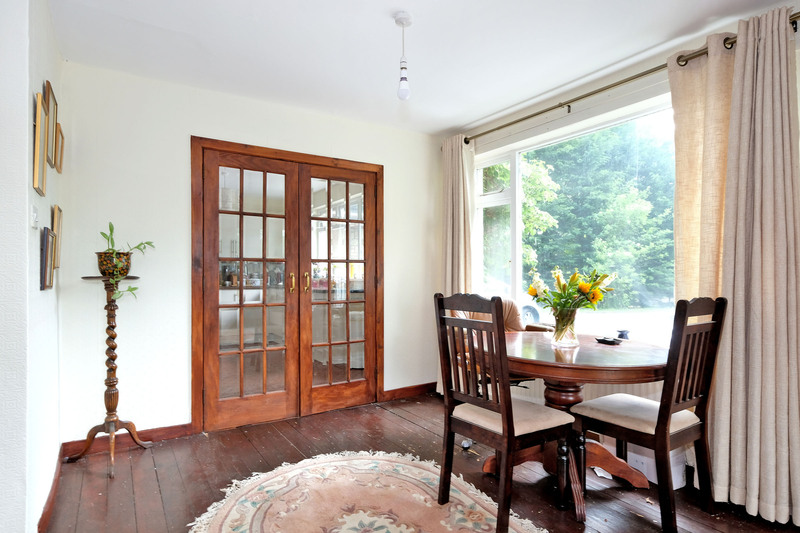 Glazed doors lead to the large Family Kitchen and Lounge. The Inner Hallway gives access to the side and rear Hallways. Door to Storage cupboard with wall cupboards, ceiling light fitment, plumbed for washing machine with worktop above. The Hall also has a door leading to cloakroom/W.C. and doors to the Family Kitchen and Lounge. Cloak Room/W.C: Door leads to Cloakroom area and further door leads into downstairs W.C. Fitted with a W.C. and wash-hand basin. Tiled splash-back behind wash-hand basin. Mirror above. Ceiling light. Opaque window. Wood effect flooring. Lounge/Dining Area: 24’5” x 16’3” (7.44m x 4.95m) A spacious bright and airy Lounge. Two large windows to side and feature picture window to front. All with curtains. Ceiling light fitment. 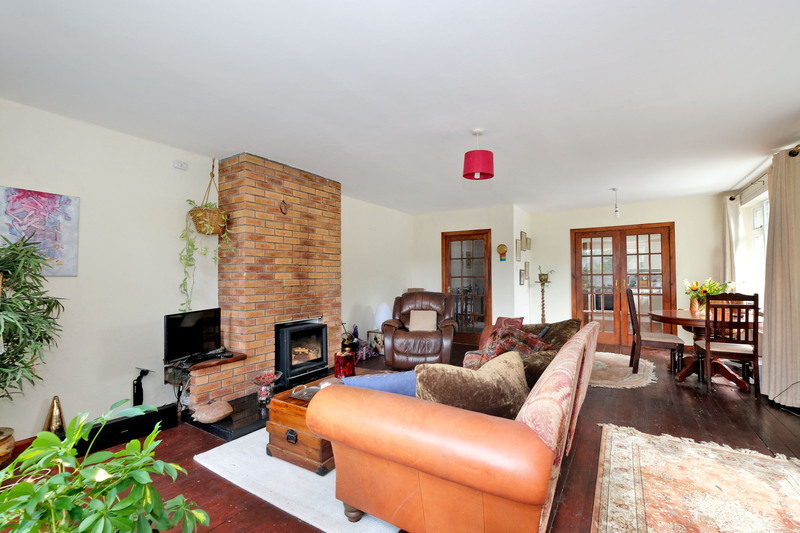 The main focal point of the room is the red brick fireplace with tiled hearth and log burner. Television point. Wood flooring. 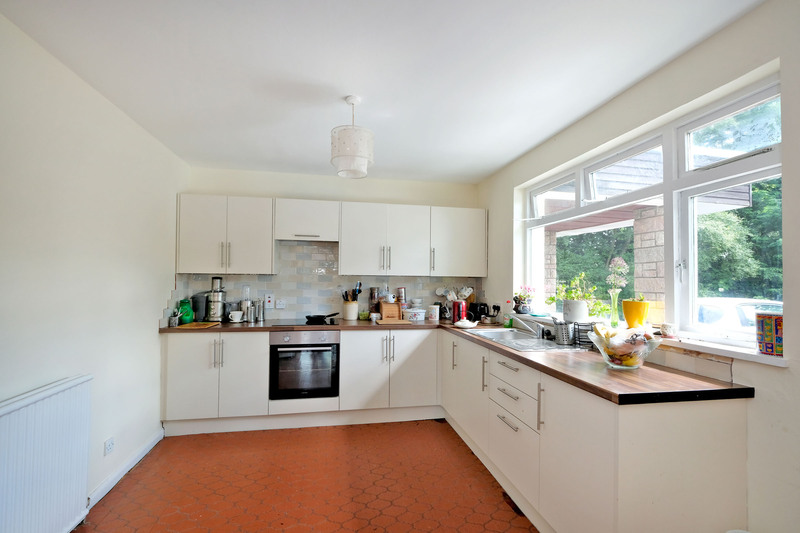 Kitchen: 14’2” x 9’11” (4.31m x 3.02m) Fitted with a range of base and drawer units. Co-ordinating worktop. Tiled splash-back and tiled behind cooker area. Integrated single oven. Four ring hob above, extractor hood. Single bowl sink with mixer tap and drainer. Space for stand alone dresser unit and stand alone fridge freezer. Ceiling light fitment. Tile effect vinyl flooring. Double doors lead to the Dining section of the Lounge/Dining Area. Rear Hallway: Opaque glazed door leads into the rear Hallway giving access to the three downstairs Bedrooms and Family Shower Room. Window provides natural light. Ceiling light fitment and smoke alarm. Door to shelved airing cupboard. Telephone point. Carpeted. 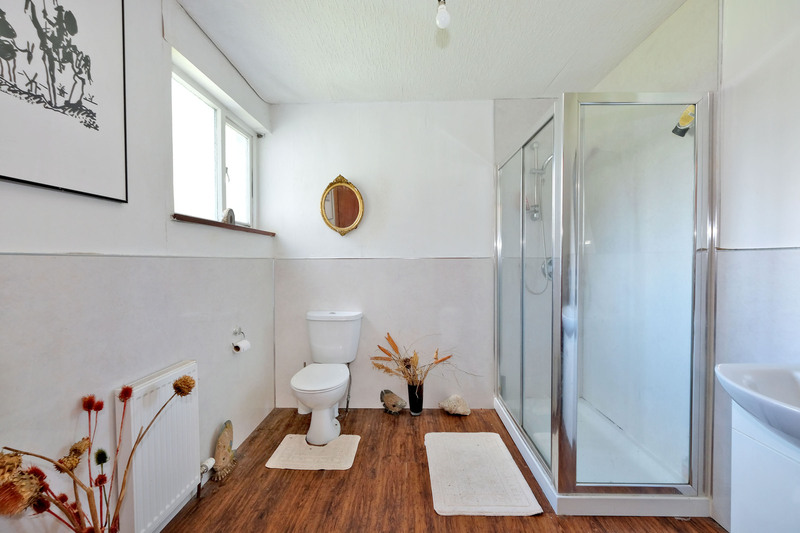 Shower Room: 8’9” x 8’1” (2.66m x 2.46m) Fitted with a white two piece suite comprising wash-hand basin on vanity unit and W.C. Separate double sized shower cubicle with sliding door. Aqua panelled behind and to dado height in the rest of the room. Mirror above wash-hand basin. Chrome fitments. Built-in shelved cupboard. Ceiling light fitment. Opaque window to side. Wood effect flooring. Master Bedroom : 15’3” x 13’3” (4.64m x 4.03m) A spacious Master Bedroom. Located to the front of the property. Large window with curtains. Decorated neutrally. Ceiling light fitment. Sliding double door wardrobe with shelf and hanging rail. Telephone point. 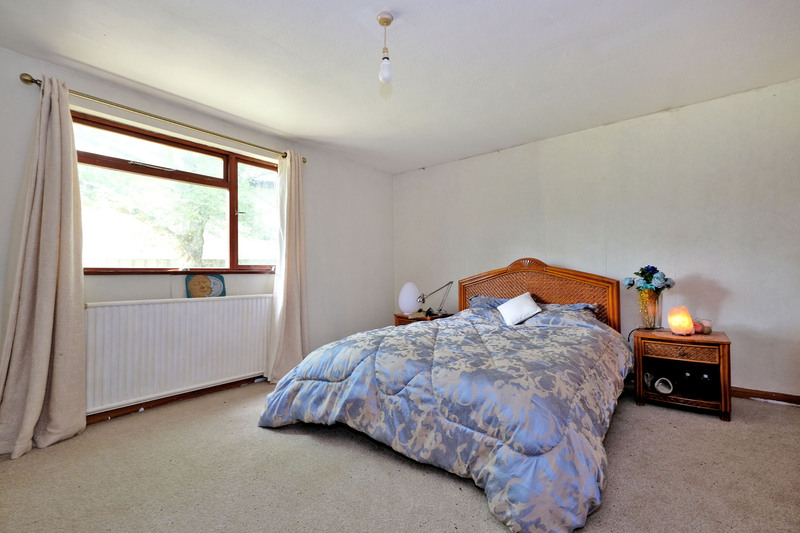 Bedroom 2: 17’7” x 8’8” (5.35m x 2.64m) A second good sized Bedroom with window overlooking the front of the property. Ceiling light fitment, decorated neutrally with carpet. Built in sliding door wardrobes with shelf and hanging rail. This is good sized second bedroom. Bedroom 3: 11’7” x 10’11” (3.53m x 3.32m) A good sized double Bedroom with window to side with Roman blind. Built in storage with shelf and hanging rail. Ceiling light fitment. Decorated neutrally. Television point. Carpet. Side Hallway: Door leads through to a Side Hallway. Part opaque glazed door and side light lead out the side garden. Ceiling light fitment. Vinyl tiled effect flooring. Carpeted stair with handrail leads to the Upper Level. Upper Hallway: 21’0” x 16’7” (6.40m x 5.05m) The Upper Hallway has television and telephone points. Ideal storage space. Ceiling light fitment. Large “Velux” window. Currently used as a sitting room this is a good use of living space. 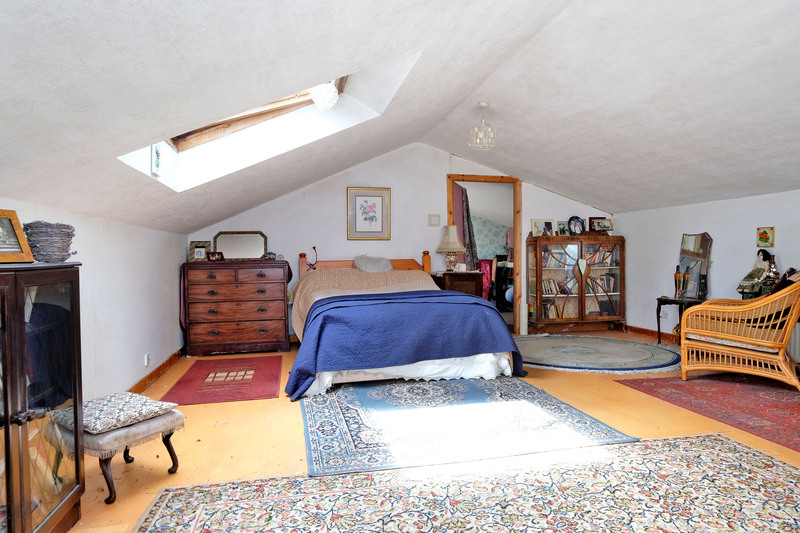 Upper Bedroom: 22’0” x 17’0” (6.70m x 5.18m) Door from Hallway gives access to a large room currently used as a Bedroom with “Velux” windows to side. Ceiling light fitments, Decorated neutrally. Telephone point, Door gives access to storage cupboard also with “Velux” window. Dressing Room: 17’2” x 10’0” (5.23m x 3.04m) Further door to the end of the Bedroom gives access to a dressing room/study/sewing room. Natural light provided from large “Velux” window. Television point. Carpeted. Outside: The property benefits from a Single Garage with up and over door. 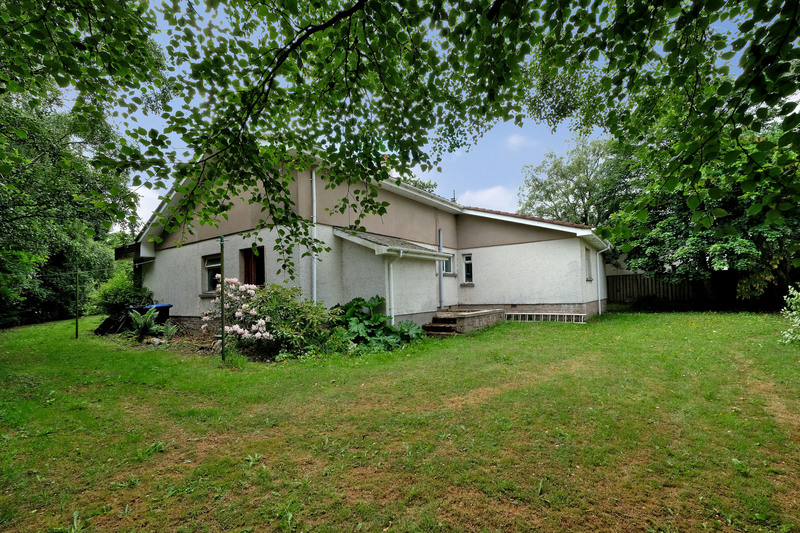 To the front of the property there is a stone chipped driveway/turning circle. Established shrubs, trees, and grassed areas. Grass to each side of the property. Single garage with up and over door. To the rear there is a door to the boiler room and storage area. Trees and shrubs on perimeter with a stream to the side. 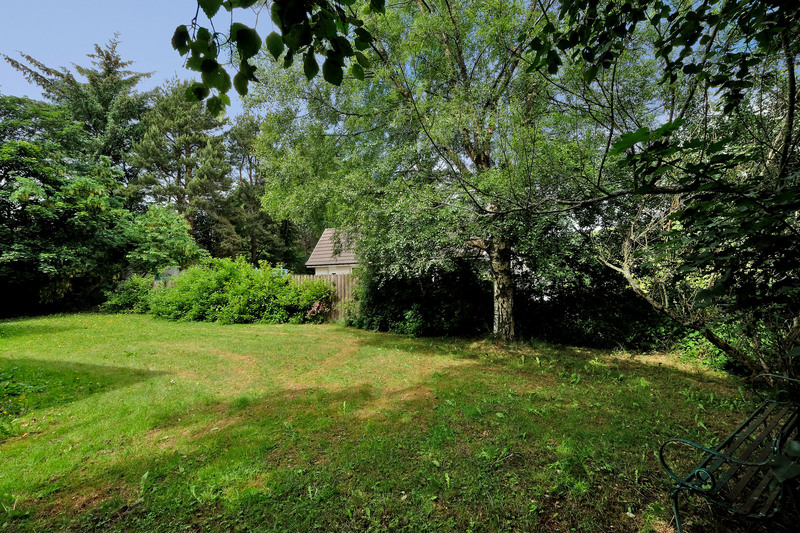 The property sits in a nice sunny plot.